Corner unit – West view – SkyPoint condo! Watch the sunset every night & events in the park right from your condo & private balcony! Recent updates include: custom sun shades with living room shades on remote, built-in shelving in all closets, built-in wine bar, & newer water heater, fridge, washer/dryer & fixtures. The kitchen boasts granite counters, stainless appliances, 42″ cabinets & breakfast bar that overlooks the spacious living room w/ views of the river, UT & more through the 10′ floor to ceiling glass windows that are double paned & impact resistant. The huge master suite has room for a king size bed, custom drapes, walk-in closet, large vanity, relaxing garden tub & separate glass enclosed shower. The secondary bedroom is perfect for guests and/or office. The attached bath has a glass enclosed shower, large vanity & linen closet. There are 2 hallway closets for extra storage & 2 assigned parking spaces in the secure garage. SkyPoint’s amenities include: 24/7 concierge service, top of the line fitness center with a cardio room & separate weight room, tropical heated pool & spa, clubroom with wireless internet, theater room, billiard table, full kitchen w/ entertainment space, outdoor grills, garden terrace, valet dry cleaning, restaurants on the 1st floor & more! HOA fees include high speed internet, water, sewer, trash & more. 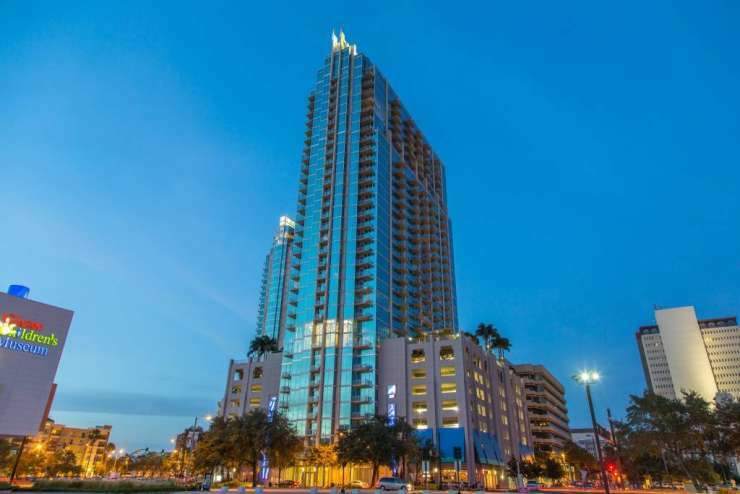 Located in the heart of Downtown & convenient to restaurants, museums, Curtis Hixon Park, Performing Arts Center, Tampa Theater, Amalie Arena, TGH, UT, Riverwalk & more!